This project was created on 10/07/2018 and last updated 3 months ago. Compared to this whole world of electronic sound devices like eurorack-modules, drummashines and all this innovative stuff from big and small companies, the electric guitar market looks a little bit boring. I play guitar but I also like those new ways of making music and I believe that a guitar could integrate great into an electronic music setup. It just needs a kind of redesign - what&apos;s technically possible shoud be done, as long as it stays to be a guitar. Here is my proposal for an open, modular guitar-synth-design with some nifty features to make modern music. This is mainly a Guitar but with a lot of unique features like an illuminated Fretboard and actuators to excite the strings. My two main driving forces to invent and build things are music and education. Often, my projects are to some extend usable in both areas. The ElektroCatser is a perfect example of that. This project is fully open source. It uses only open source libraries and all the design files can be opened with open source design tools. A git repository is also on the way to make this project better to collaborate. The title says it all: Here&apos;s a big update to my ElektroCaster! stay tuned for some music! One design goal I have for this project is to make it a standalone intrument, meaning tha you don&apos;t need to connect more cables than the audio cable to the amp, to play with it. The only thing missing to get there is an integrated battery. But for now, I focus on optimizing the powering over the RJ45 cable, since this has to work also and should be used to charge the battery too. Firstly, the ElektroCaster can be played like a normal (baritone-)guitar, which in itself I&apos;m quite proud of. It&apos;s neck is admittedly kind of thick and I whish there would be thinner v-slots available (15x15 would be nice). But all in all, I really do enjoy playing it. Let&apos;s talk about what the ElektroCaster can do what others can&apos;t, by quickly sketch some possible applications. Some of them I allready have implemented and some are in the pipeline. Designing a control interface is arguably the most crititcal part when you develope a product. This may be especially true when designing instruments, with which you want to dive into sonic worlds and be in flow with the music. There is nothing more distracting if you have to think too much to achieve a certain effect. Thats why musicians have to practise so much. The idea of the MultiBow, which I&apos;m currently trying to realize, builds on this concept. It&apos;s essentially six EBows firmly installed under the strings. The allready installed hex-pickup serves as sensor coils and the driver coils are integrated with small class-d amplifiers into another pickup looking package. So the six signals from the pickup are going throug The Teensy-audio-board I use. It has 8 output-channels and I do only need one or two for the main output. One idea was to have additional discrete outputs for each string to process them externally. But using them as part of the MultiBow does make more sense to me, as it opens up the possebillity to modify the feedback signal to alter the effect on the strings (see moog guitar). The KickUp is an actuator which includes 6 solenoids and a mosfet driver. It&apos;s used to hit the srtings from beneath - just the opposite of a pickup. Now the ElektroCaster can play semi-automatically (you still have to use the left hand). See the the KickUp in action in the sequencer video on the details page! Since this guitar is intended to be used in an ectronic music environment, it has to communicate with the rest of the gear, at least to get a clock signal on which it can synchronise it&apos;s actions. I used three different types of components to build the basic shape of the guitar: 3d-printed parts, 20*20 VSlot profiles and plywood. My printer (Creality CR10S4) has build volume of 40*40*40cm. 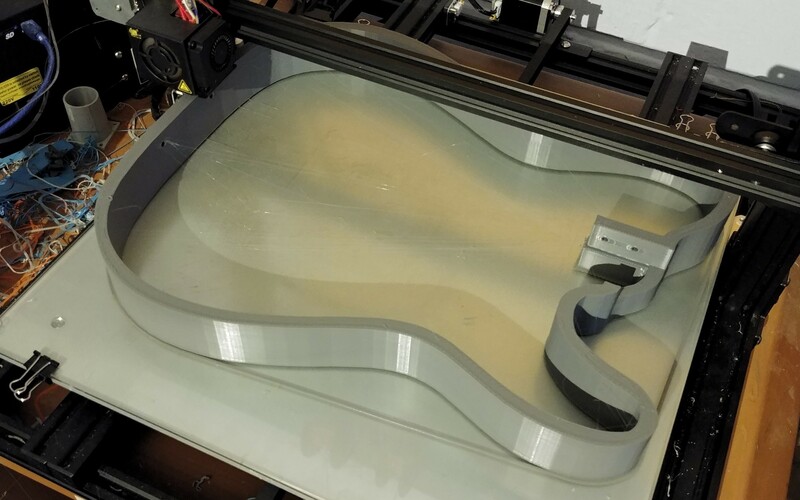 Beeing able to print the shape of a guitar body was the main reason I went for this big printer. Discrecete audio path for each string to allow for independent audio manipulation. Audio processing happens within the guitar, not on an external computer. low power consumption to allow for battery operation. An iluminated fretboad is nice to have, but making the corresponding frets touch-sensitive, the fretboard becomes a powerful userinterface. This isn&apos;t for somebody who just want‘s to get the needed parts and assemble it like a diy-guitar-kit (yet). There will be some hurdles to take and difficult manual labor to make. Although this is a working prototype, this project is still (and may allways will be) work in progress. Software and interface are hardly developed yet. Think of it like a protoyping platform: wack in a new headstock with robotic tuning features, try a new actuator beneath the strings or change the neck over an improved one – thanks to the modular design, all of this can be relatively easy achieved. There is not "the one ElektroCaster". It&apos;s parametrically designed in OpenScad, which is why many features can be changed: The number of the strings, the length of the scale, the spacing between the strings (at neck and bridge positions) or the number of frets can all be edited whithin the parameters.scad file. That means, you could also make a small four-string-ukulele-version out of it. A big 3d-printer with 400x400x400 build volume, because there are many big parts, which can&apos;t be split easily. A cnc-router or laser-cutter wtih a build size bigger than the body (322x396mm). A method to make the pcbs, I used my cnc-router. The core of the ElektroCaster is made of aluminum V-Slot profiles. I started whith a v-slot-starter-kit from RatRig, which I do recommend to get. Tab to make M5 threads. 1) Cut the profiles so that you end up whith the following lengths: 2 x 50cm(D), 2 x 25 cm(A), 4 x 12.5(B,C,E). 2) Drill some 5mm holes to screw the parts A,B,C,D together. My v-slots allredy came with threads on both ends but since you cut them, you‘ll need to tab some threads to the A parts. 3) Drill holes near the ends of E and use t-nuts to connect them to A and D. There are no exact measures how to put them. They‘ll probably need to be adjusted when mounting the printed body in the next step (which is no problem since the n uts can be easily moved). 1) Print the body.stl file (/hardware/mechanical/stl/body.stl). I used a .6mm nozzle, .8mm extrusion width an .3mm layer height. 2) Attach the printed body-frame to the slot-body using M5 screws and t-nuts. The screws need to be cut to length. One screw doesn&apos;t need a t-nut as it&apos;s directly put into the slot-body. This screw is one of those you allready used in step 2. I don&apos;t think this is really needed so I may remove this in future versions. Absolutely awesome Frank! The possibilities are endless. If you can get the platform out there and an SDK to make it easy for anyone to develop, it would do for the guitar world what the PC did for the IT industry. Maybe hardware kits while you sort out a finished product?? Just want to chime in to say Frank this is an awesome build brother! Thank you for sharing hope your able to bring this to the masses for teaching. Neat, I&apos;m working on something very similar but I want to do an harp instead. (I&apos;m not as advanced in the project as you are). Single coil pickups can be found as low as 3$ online, so I was thinking of using one for each individual string. So far my arduino uno can directly listen to the pickup, without any extra components. The audio isn&apos;t good quality, but it&apos;s clear enough that I&apos;ll be able to play a guitar hero clone with the harp. I&apos;m still debating what I will replace the uno with. Since I&apos;ll have at least 12 pickups, I assume I&apos;ll need two boards (2x the cost). I don&apos;t need as much processing power than you (I want to plug in a pc, not an amp) but I do wonder what kind of quality I could get with a teensy alone (no board). Alternatively, I could try multiplexing 2 pickups per pin which would half the sample rate of each one. While the loss of quality of doing so is quite drastic for percussive instruments, it seems much less pronounced for guitar strings. Just wanted to chime in that this is sooo cool! One thing that came to mind (from someone who has intermittently tried to learn the guitar) is to leverage this type of system for straight-up teaching of the guitar. Also, I want to productize this something real-bad. Do you have any interest in doing that? I think this could be tailored for just this purpose and be quite inexpensive to produce. So yes, I&apos;m basically interested to make a product out of this, but there are no concrete plans yet. Sounds good. Well for what it&apos;s worth I&apos;d be happy to help out. I think this concept/product could sell well. 2. I&apos;m an EE. So I can help productize that side. 3. I happen to have a buddy who last year started a Industrial Design and Mechanical Engineering services company, so his business could definitely take the mechanical side through product. A sequencer that offers the possibility to be connected modularly and musical operators to build up more complex live electronic music. You are about to report the project "ElektroCaster", please tell us the reason.